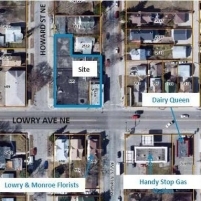 The primary development objective for the site is to create a community amenity that invigorates the Lowry/Monroe intersection and helps catalyze adjacent development along the Lowry Avenue corridor. RFP attached. 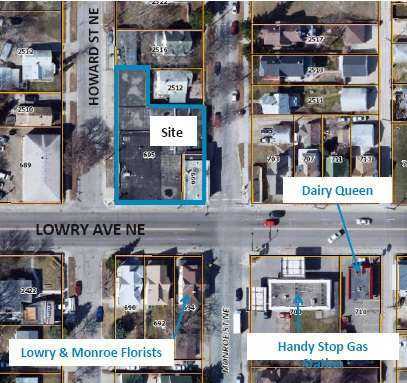 The 0.3 acre site is three blocks west of Central Avenue, a busy commercial corridor, and situated between two closely aligned streets with 108 feet of frontage on Lowry. The City will sell the properties for $150,000 plus related fees. 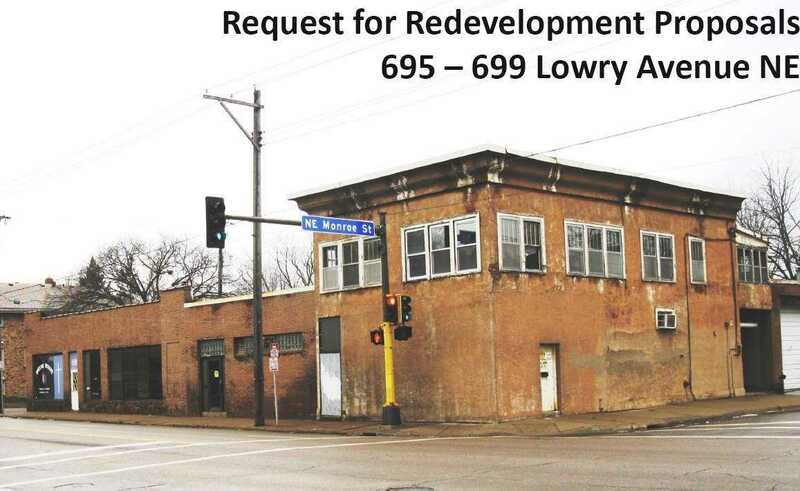 However, RFP respondents must also demonstrate the financial and organizational capacity to complete any rehabilitation or new construction proposal they have for the property. Prior to closing on a property sale, a selected developer is expected to secure all financing, receive City planning approvals and building permits, and complete all due diligence necessary to complete their project. 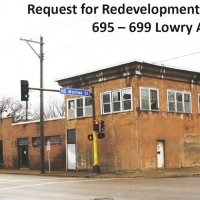 Both buildings are in dilapidated condition with little updating or maintenance. The second floor apartment has not had a rental license since 1996 and was condemned for lack of rental housing maintenance in 1997. The exteriors and interiors of both buildings would require extensive renovations. The costs to cure the deficiencies may not be justified. Both buildings are considered to be fully depreciated and at the end of their economic life. In November 2015, Summit Envirosolutions completed a Phase I Environmental Site Assessment for both properties. Respondents should review this report in detail prior to submitting a proposal (see RFP Exhibit 1). 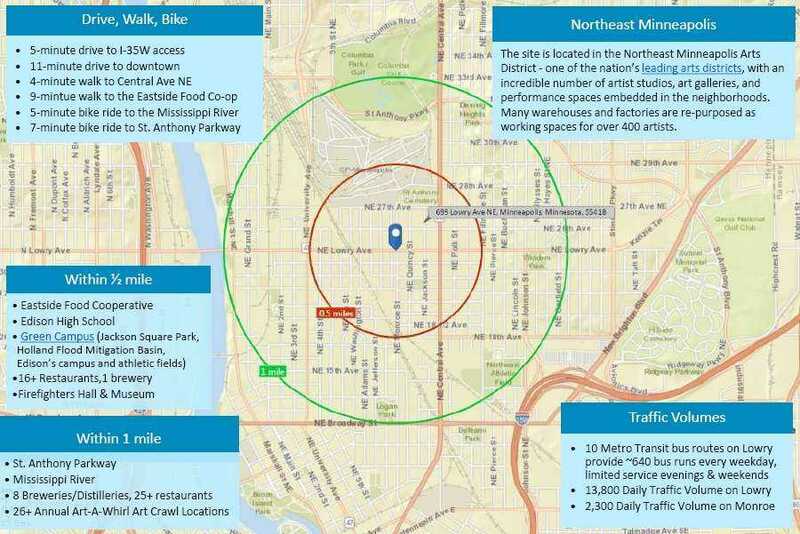 The Phase I recommends a Phase II due to the site’s historic uses, including as a filling station, mechanical shop, and electrostatic paint shop with solvent waste. The report also recommends a Hazardous Materials Survey due to the age of the buildings. It will be the responsibility of a selected developer to further investigate and address the pollution remediation needs as required by current standards and MPCA regulations. As the nature and severity of the site’s environmental condition is further determined, the developer may seek brownfield cleanup grants to help pay for contamination cleanup costs. 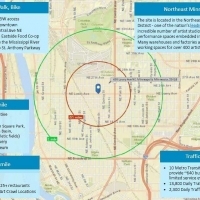 Depending on the remediation needs and costs and subject to City Council approval, a redevelopment project may be eligible to receive brownfield remediation grants from Minnesota’s Department of Employment and Economic Development (DEED), the Metropolitan Council, or Hennepin County. The City works with applicants to review proposed projects and submit applications to the grantors.